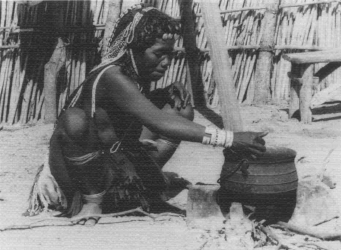 The Mbukushu – like the Bantu people living in the western areas (Gciriku, Shambyu, Mbunza and Kwangali) – originally come from central Africa, today’s Namibia and South-East Angola. At the beginning of the 19th century they moved to the Caprivi, Botswana and Namibia. Their royal clan possesses the hereditary power of rainmaking which was successfully practised under the eyes of the colonial administrations until the middle of the 20th century. Payment of tribute by the neighbouring peoples profited the royal clan with wealth as well as with huge political power in the whole region. Only the radical changes during The Thirty Years’ War in Angola that ended recently, were able to convulse the economic and political stability of the “Rainmaking People” persistently. 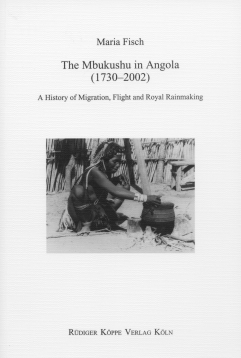 The book considers the early history of the Mbukushu as well as the disturbances of the last decades. It contains several historical photos with strong expressiveness and some maps with the regions mentioned in the text. On the one hand, this historical monograph is based on the collection of oral traditions and interviews with time witnesses in their own language compiled over many years. On the other, it represents an evaluation of the literature written about this region since the 19th century, and of unpublished material in governmental and missionary archives. Fisch’s study is a rare piece of work, giving indeed an impression of the evolution of an African population group over two centuries. Using literature and archival sources Fisch relates events in a ‘close distance’ style focusing on the action of individual people [...] involved in the migration process and conflict.